' Baby Quilt - Sisters, What! Second quilt finished. I love this pattern. My mom actually made a quilt for my 3rd child from this same pattern and he sleeps with it every night. I still love the pattern 2 1/2 years later. There is something about strait lines and stacks that I just love. For this one I used the line from Sweetwater called Family Reunion. I debated putting the flower prints in the mix but with the help of my quilting friends I decided that they look OK for boys too. I did however leave out the daisy prints...too much girl in those. I am officially in love with making baby quilts because they come together so quickly...and they fit better on my wall when I hang them. 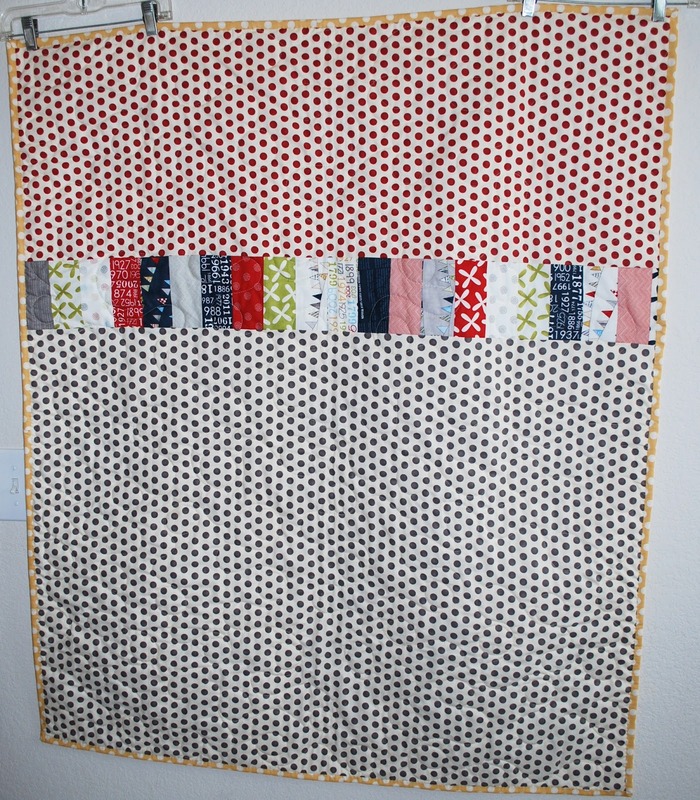 I am calling this one "Backyard Barbecue" because this is what the fabric reminds me of...summer, hot dogs, and family. I wasn't sure what to do for the back but had these two polka dot prints from another Sweetwater line and I think they fit pretty well. 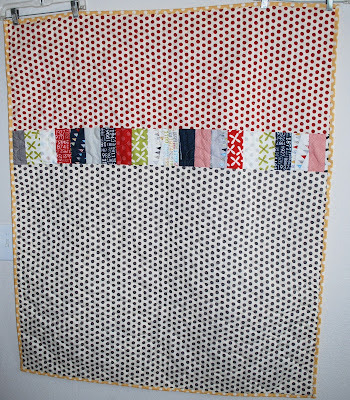 Anyway here's to finishing the baby quilt before the baby actually gets here...yay! 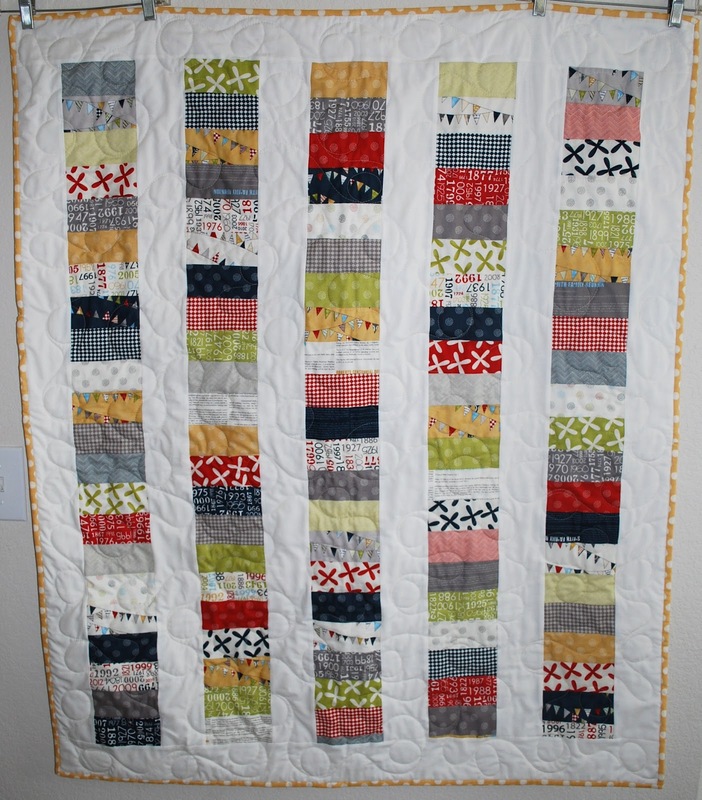 I love seeing these quilts - but I'm curious: do you do the quilting yourself? Free motion, hand stitched, send it to a quilter's? I'm so impressed!! Thanks for sharing! Heather...I do everything but the quilting...I am not totally in love with the quilting the new lady did so I probably won't use her again but am grateful for someone who can do it for me. I know people do it on their machines all the time but the foot for my machine would cost a lot and then I would actually have to blunder on a quilt till I actually got it down and I just don't want to mess up any of my quilts. I love the fabric...Sweetwater is my fave! Looks great! So happy you are going to have your hubby back soon. Cute and I love the name! Great pattern! Very, very, cute. I love. So fun. This is adorable. I like the stacks too and have been looking for a pattern that is not too difficult for my next project but one. I also love the back with the one stripe. 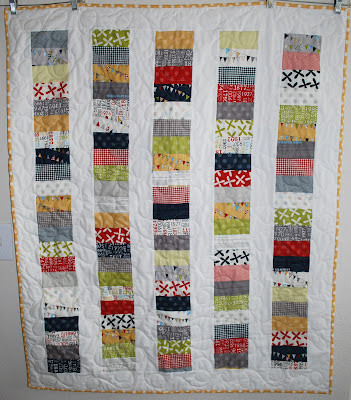 i love these coin quilts as well...seriously Joy, you are amazing! !